A Seattle man trying to dribble a soccer ball 10,000 miles to Brazil in time for the 2014 World Cup died Tuesday after being hit by a pickup truck on the Oregon Coast. Police in Lincoln City, Ore., said 42-year-old Richard Swanson was hit at about 10 a.m. while walking south along U.S. Highway 101 near the city limits. He was declared dead at a hospital. The driver has not been charged. Lt. Jerry Palmer said investigators found materials among Swanson's belongings listing his website, breakawaybrazil.com. 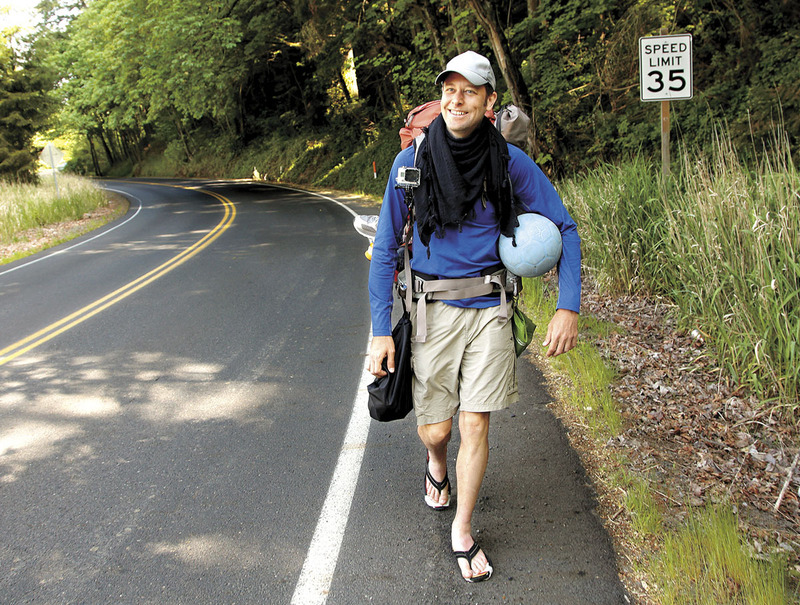 Swanson set out on the trek to promote the One World Futbol Project, based in Berkeley, Calif., which donates durable blue soccer balls to people in developing countries. "We are deeply saddened to learn about Richard's death," Lisa Tarver, chief operating officer of One World Futbol Project, said in a statement. "He was a very inspiring man who in a very short time walked his way into many lives. Our thoughts are with his family." Police said Palmer's soccer ball was recovered. Kristi Schwesinger, a Seattle interior designer and close friend of Swanson's, said he had been a private investigator for many years, and switched to a new career as a graphic designer, but was laid off recently, and looking for an adventure. "He was at a point in his life where he had raised his kids," she said. "Both his boys (Devin and Raven) had graduated from high school. He had no mortgage. He had sold his condo recently and was between jobs. "And he loved the game of soccer," she said. "He stumbled on this great organization, One World Futbol, and decided this would be his passion the next year." In an interview with The Daily News in Longview, Wash., Swanson said he picked up soccer just five years ago and played on club teams and rooted for the Seattle Sounders. "I felt destined that I should go on this trip," he said. His website said he left Seattle on May 1, and the trip would take him on foot for more than a year through 11 countries before reaching Sao Paolo, Brazil, where the World Cup soccer tournament will be played. "It will be a trip of a lifetime where I will push myself further than I ever thought possible," he wrote. Swanson started out in flip-flops, and managed to spend 13 nights but switched to hiking sandals in Portland, Ore., Schwesinger said. He stayed two nights in Vancouver, Wash., with his son, Devin, but otherwise had been able to sleep on the couches of one stranger after another who befriended him and helped him on his journey. "It was all by word of mouth, Facebook, media contacts, friends and family who put the word out," Schwesinger said. Swanson spent Monday night in Lincoln City, where he was able to soak in a hot tub, and eat a gourmet breakfast, before he set off for Newport, not knowing where he would stay, she added. He posted photos and stories about his new friends on a Facebook page chronicling his journey. The page was updated with news of his death Tuesday afternoon. Friends are talking about creating a foundation in Swanson's memory, and sending his two sons to Brazil for the World Cup, Schwesinger said. "The hardest thing is he was so young," Schwesinger said. "Just today we were planning his surprise birthday party for Sunday. He was so young, so full of life, so excited by the journey he was on. To be taken from us so soon is really heartbreaking."